Tumor-infiltrating leukocytes (TILs) represent a minority of the complete cell population within tumor tissue. In this application protocol, we describe a time-saving workflow that overcomes this limitation and increases sensitivity of downstream analyses. Mouse tumor tissue is dissociated into a viable single-cell suspension and TILs (CD45+) are enriched via MACS® Technology. PBE buffer: Prepare a solution containing phosphate-buffered saline (PBS), pH 7.2, and 0.5% bovine serum albumin (BSA), and 2 mM EDTA by diluting MACS BSA Stock Solution (# 130‑091‑376) 1:20 with automMACS® Rinsing Solution (#130-091-222). Keep buffer cold (2−8 °C). Degas buffer before use, as air bubbles could block the column. Always use freshly prepared buffer. ▲ Note: EDTA can be replaced by other supplements, such as anticoagulant citrate dextrose formula-A (ACD-A), or citrate phosphate dextrose (CPD). BSA can be replaced by other proteins, such as mouse serum albumin, mouse serum, or fetal bovine serum (FBS). Buffers or media containing Ca2+ or Mg2+ are not recommended for use. 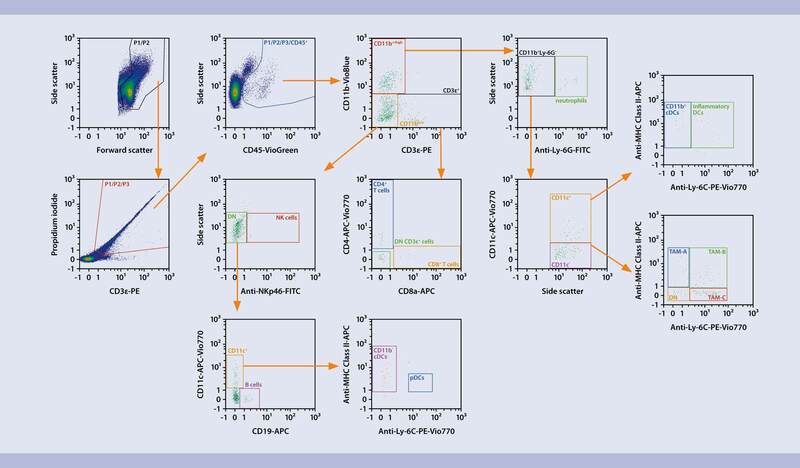 (Optional) Fluorochrome-conjugated REA (REAfinity™ antibodies: recombinantly engineered, lacking Fcγ-binding site) CD45 antibodies for flow cytometry analysis, e.g., CD45-VioBlue®. Learn more about our antibodies and dyes. ▲Note: Due to expression of Fcγ receptors on tumor-infiltrating leukocytes, REA antibodies are recommended. (Optional) Propidium Iodide Solution (# 130-093-233), DAPI Staining Solution (# 130-111-570), 7-AAD Staining Solution (# 130-111-568), or Viobility™ Fixable Dyes (# 130-109-812, # 130-109-814, # 130-109-816) for flow cytometric exclusion of dead cells. The materials and methods described in this Application are for the manual protocol. Automated cell isolation can be performed with the autoMACS® Pro or the multiMACS™ Cell24 instruments. The following instructions are for manual cell enrichment. PBE buffer: Prepare a solution containing phosphate-buffered saline (PBS), pH 7.2, 0.5 % bovine serum albumin (BSA), and 2 mM EDTA by diluting MACS BSA Stock Solution 1:20 with autoMACS Rinsing Solution. Keep buffer cold (2−8 °C). Prepare buffer fresh and degas prior to use. ▲ Note: EDTA can be replaced by other supplements such as anticoagulant citrate dextrose formula-A (ACD-A) or citrate phosphate dextrose (CPD). BSA can be replaced by other proteins such as mouse serum albumin, mouse serum, or fetal bovine serum (FBS). Buffers or media containing Ca2+ or Mg2+ are not recommended for use. Create a viable single-cell suspension from a solid mouse tumor using the gentleMACS™ Octo Dissociator with Heaters in combination with the Tumor Dissociation Kit, mouse. Follow the protocol of the kit data sheet. 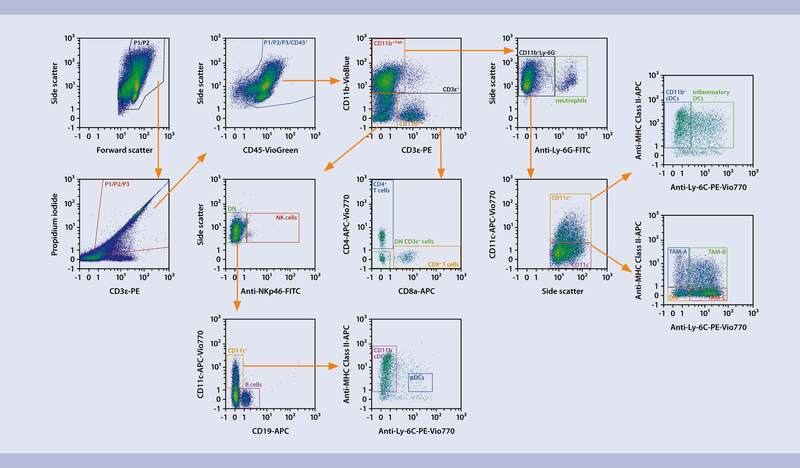 Enrich tumor-infiltrating leukocytes using CD45 (TIL) MicroBeads, mouse, and LS or MS Columns. Follow the protocol of the kit data sheet. We recommend filtering the magnetically labeled cell suspension to guarantee it is single-celled before separating it on the column. Place a Pre-Separation Filter (30 µm) on the LS or MS Column. Rinse the column 3 times with PBE buffer, ensuring that the filter is pre-wetted. Apply the cell suspension and washing buffer to the filter on the column. Subpopulations of tumor-infiltrating leukocytes in B16F10 tumor tissue without prior enrichment. An example gating strategy used to identify TIL subpopulations performed on a single-cell suspension without prior enrichment of TILs. Subpopulations of tumor-infiltrating leukocytes in B16F10 tumor tissue after enrichment. The same gating strategy used to identify TIL subpopulations performed on a single-cell suspension after enrichment of TILs with the CD45 (TIL) MicroBeads, mouse. Brauner, J. et al. (2017) Workflow automation and parallelization improves the isolation and analysis of tumor-infiltrating immune cell populations. AACR, Washington D.C., USA. Application Note: Functional TILs from human renal cell carcinoma. Baldan, V. et al., Manchester Academic Healthcare Science Centre.